JACKSON, Miss. – Three recent graduates of the University of Mississippi have been awarded Mississippi Rural Physicians Scholarships valued at $30,000 per year for their medical training at the University of Mississippi School of Medicine in Jackson. 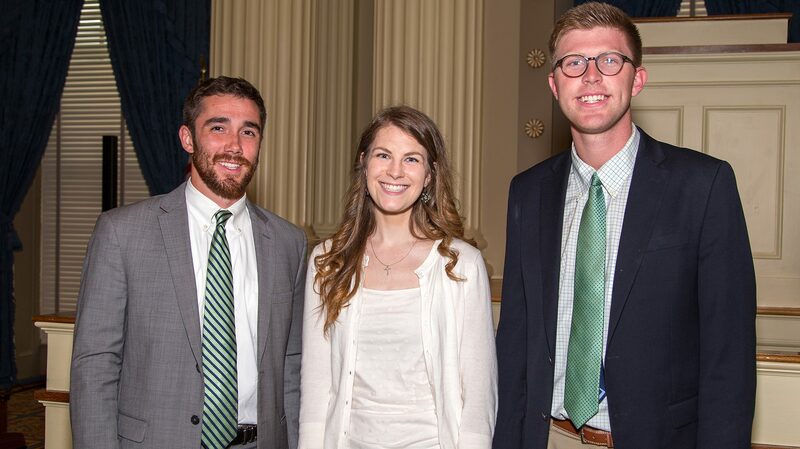 Cal Wilkerson, Alison Redding and Kaleb Barnes were honored at the annual ceremony for the Mississippi Rural Physicians Scholarship Program. Wilkerson is the son of Mr. and Mrs. David Wilkerson, of Woodville. Redding is the daughter of James and Carolyn Cegielski, of Laurel. Barnes is the son of Rodney and Melissa Barnes, of Booneville. Created in 2007, the Mississippi Rural Physicians Scholarship Program is designed to provide more primary care physicians in rural areas of Mississippi. During medical school, each scholar receives $30,000 per year, based on available funding. Consistent legislative support of the scholarship program translates to 60 medical students receiving $1.8 million to support their education this fall. “The Mississippi Legislature celebrates with these Mississippians from across the state in their commitment to improving health care for rural Mississippians by becoming rural primary care physicians,” Senate Appropriations Chairman Buck Clarke said. Besides the legislative support, three privately funded scholarships were also awarded this year. Upon completion of medical training, the scholars must enter a residency program in one of five primary care specialties: family medicine, general internal medicine, medicine-pediatrics, obstetrics/gynecology or pediatrics. The scholar must provide four years of service in a clinic-based practice in an approved Mississippi community of 20,000 or fewer population located more than 20 miles from a medically served area. The Mississippi Rural Physicians Scholarship Program provides a means for rural Mississippi students to earn a seat in medical school and to earn a $120,000 medical school scholarship in return for four years of service and learn the art of healing from practicing rural physicians. For more information, contact Dan Coleman, MRPSP associate director, at 601-815-9022, jdcoleman@umc.du or http://mrpsp.umc.edu.